The first mention of a Government school in Two Wells is in the SA Government Gazette of 1863, where the Port Gawler North School is listed as one of 16 school houses in the course of erection. The school opened in 1865 with William Tupper as head teacher and 32 pupils in attendance. The local newspapers reported in 1873 that efforts were being made to increase the school house accommodation and in July over £30 was collected at a meeting called to discuss the project. Later, in October a bazaar was held in Mr Warren's wheat store (now the grocery shop opposite the old school) and £64.15.0 was raised. 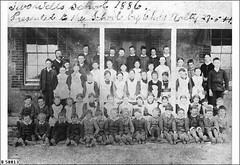 The efforts were successful because the Education Gazette 1874 records that the Two Wells school house was enlarged. The school buildings remained the property of the district council until 1876 when the Board of Education began negotiations to take them over. The district council was agreeable to this providing they received £45.10.0 reimbursement for the money they had recently spent on the new floor of the Lewiston School and the whitewashing of the three school houses at Lewiston, Two Wells and Reeves Plains. These negotiations were completed and the deeds handed to the Board of Education. The earliest school register began 1 January 1878 when Mr Robert Hoar was appointed teacher in charge and he entered the names of students who were in attendance in 1877. Among those names on the first page are found Thomas, Alice and Robert West, William and John Secomb, James and Eva Manuel, Timothy Rowe, Albert and Frederick Day and James McCord, all names associated with the early settlers who worked hard to establish the Port Gawler district. 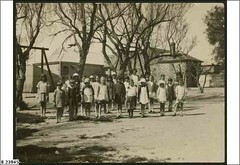 Enrolments remained around 50 children and in 1908 the first junior teacher was appointed. The numbers of pupils fell in 1910 to below 40 until the closing of the Lewiston School in 1945 when it rose again to 47. During World War II slit trenches were dug for children, and the head teacher at the time, Mr R. Dent, noted in his report how the trenches could be occupied within one minute from the alert signal. Fortunately these were never needed. By 1950, 76 pupils were crowded into the school and accommodation was critical. A third teacher was appointed and a class was housed in the nearby old council chambers. In 1955 the enrolment reached 100 and two portable buildings were acquired. This made room for an all-pupose room and the beginning of the excellent school library. With an enrolment increase of 63% over nine years to 1959 and 39% of these children from migrant families predominantly from southern Europe, a new era was entered. The increase in numbers continued and by 1970 had reached 182 with 66% from migrant families. During the years of growth to 1978, 12 temporary classrooms were added to house the students and provide administration offices and staffroom. Other changes were also taking place and in 1976 the school became part of a pilot programme aimed at an awareness of the other cultures in our society. Greater involvement by parents was achieved through committees formed to discuss and implement education, ethnic affairs, playground equipment and planning for a new school. 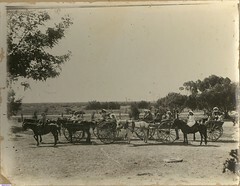 The growth continued and after 114 years of continual use the old site was vacated on 23 May 1979 for the new school on Gawler Road. Do you remember Port Gawler North (Two Wells) School ? Then Join up and add your memory here.